As planned, I was able to get out and both hike and fish this weekend. The hiking was good and provided me some good opportunities to do some photography. On the other hand the fishing was slow to say the least. In fact, this was my first trip without a fish landed in quite a long while. Not that I didn't have my chances. Over the course of the day yesterday, I had several follows and at least one fish that ate. I just couldn't finish the deal with a good hookset. On Saturday I hiked to Virgin Falls on the Cumberland Plateau. I have been there a few other times and always enjoy seeing it again. The waterfalls in this area are all very unique in that they fall into caves or just vanish underground. Virgin Falls itself had a greater volume of water than any other time I have visited it. Also, the spray off of the falls had collected into beautiful ice deposits on the trees and bushes, giving the forest the appearance of a large ice storm. The other area falls were nice as well. On the way back up the trail I spent some time photographing one of the area streams. The pocket water and plunge pools would constitute an amazing trout stream, but unfortunately the water temperatures and flow are too inconsistent to support trout. Here are some of the pictures from the hike this past weekend. I should have spent some time photographing the Smokies streams in the snow but was too concentrated on the fishing. 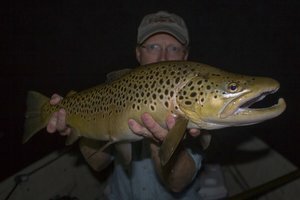 High water has been the theme lately, both on tailwaters and on the freestone streams of East Tennessee. 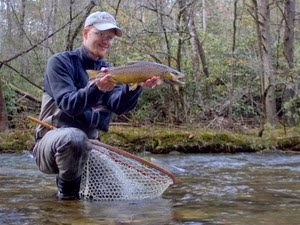 I had been planning to fish the Smokies this past weekend for awhile now. High water just meant a better chance for large fish. Friday was perfect for throwing big stuff on Little River. After stopping at Little River Outfitters, I drove on up the river. The water was up to around 1800 cfs when I started and continued to rise throughout the day. Eventually it peaked at somewhere around 2500 cfs. Finally I found the pool that I wanted to start on. After rigging up, I thoroughly fished the first pool without glimpsing any fish. That is never a good way to start, but I moved on to the next pool with high hopes. Things improved but not immediately. I worked the pool slowly and methodically and finally had a brown come out and slam my offering. Thankfully the fish found the hook, and I was soon admiring my first fish of the day. 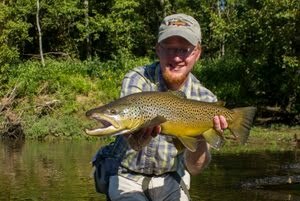 The brown was pretty but not very large. Still, a fish is a fish, and I wasn't about to complain. The rest of the day brought a lot of hope but each time I was disappointed. Several fish came out to play but each one just couldn't seem to find the hook. Visiting the Park is probably just about my favorite thing to do though so I had an enjoyable day. Fishing in high water is always sketchy. Catching one fish is always better than catching no fish. 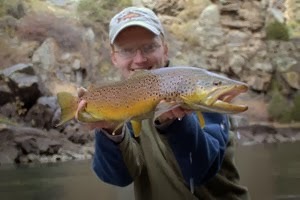 Next time I hope to fish during normal flows. 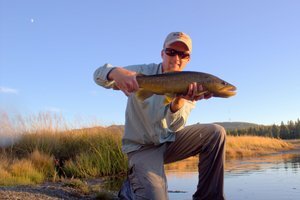 Sight fishing is the way to go but almost impossible during high water. Of course, in a month or so we'll be fishing the spring hatches. Those of you that are looking forward to the hatches just remember that there are bugs hatching now. Everyone is excited to fish the "big" hatches in the spring but there are plenty of bugs hatching now. You just have to spend a little more time finding the hatch. Midges, various dark stoneflies, and even a few blue quills and blue-winged olives are hatching. Finally some snow!!! Here in Tennessee, we don't get as much snow as when I was a kid. A snowfall is always an exciting event. Starting January 29, we got more than the usual snow. The first several inces fell just like normal but around 11:00 p.m. on the 29th, warm air above the surface started changing the snow to freezing rain. The flakes were melting before hitting the ground but the surface temperatures were still below freezing. The result was quite unusual for this area. We had a layer of snow with a layer of ice on top. Usually when we get both, the order is reversed.